See this web site for campaign details. The campaign-specific information on this site continues to be updated and expanded upon periodically. of the GM to Milwaukee, WI. the waiting list, contact the GM. Daeoria (Day-OR'-ee-ah) was originally conceived under the 1st edition rules in the early days of D&D in the late 1970s and early '80s. It was revised for AD&D, then for 2nd edition rules, and then again for the 3.5 version of D&D. After discussing it with all participants it has been revised (yet again) for the Pathfinder rule system. All the old movers and shakers of Daeoria are still there: Maexon (May'-zon), the Elven Magic User; Tonsu, Maexon's Yeti Paladin companion; and their arch nemesis, Xox (Zoks), the evil White Dragon. A Plea For Help . . . 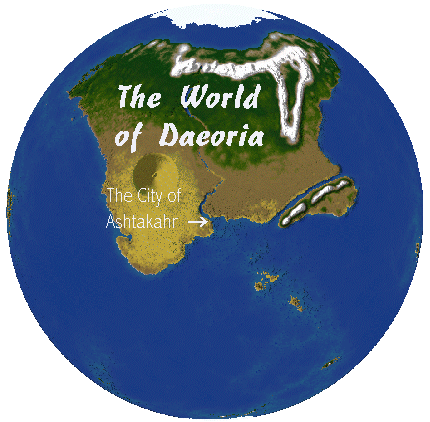 The world of Daeoria is comprised mostly of water. There are a few groups of small islands scattered around the world, and fewer still relatively large islands, but only one large (approximately the size of the Eurasian continent) land mass, the continent after which the world is named: Daeoria. PC finds a wizard who specializes in interplanar travel and knows of Daeoria. At considerable expense, the wizard magically transports the PC to the astral plane near the Daeorian portal. PCs must make their way through the astral plane from their arrival point to the Daeorian portal. PC then emerges from the Daorian portal in the city of Ashtakahr. Read Orgar's Tale for an example of a story of someone leaving his world and coming to Daeoria. The management of Ashtakahr is handled by a race of large, brooding characters wearing hoods and cloaks that most sensible people don't want to mess with. The laws of Ashtakahr are strictly enforced, most penalties are either enslavement or death. Most of what is known about the world of Daeoria, by those outside of Daeoria, has been compiled and disseminated by the elven wizard, Maexon, as part of his ongoing efforts to enlist the aid of good and noble persons to help overthrow the evil forces that dominate and rule his home world. This information on these pages is provided to help prepare those who come to Daeoria to survive in a hostile and dangerous world. This information must, of necesity, be incomplete and even sometimes misleading. Because the material is so widely and indiscrimanently disseminated, it must be assumed that it will, at times, fall into the hands of those Maexon wishes to see fall. Therefore, he must omit information that would identify the individuals who fight against the evil oppressors. He must not identify cities, towns, regions or individuals that give aid and shelter to those who oppose evil. This web site uses trademarks and/or copyrights owned by Paizo Publishing, LLC, which are used under Paizo's Community Use Policy. We are expressly prohibited from charging you to use or access this content. This web site is not published, endorsed, or specifically approved by Paizo Publishing. For more information about Paizo's Community Use Policy, please visit paizo.com/communityuse. For more information about Paizo Publishing and Paizo products, please visit paizo.com. Daeoria and this web site are copyright © 2003–2019, Patrick L. Hagerty. All rights reserved. Pathfinder Roleplaying Game is a trademark of Paizo Publishing, LLC Dungeons and Dragons® is a registered trademark of Wizards of the Coast, LLC.